Peace and Blessings to you, your family and loved ones. I found this article while searching for “Kryon” on the internet. I wanted to know who he was and what his pull was, so to speak. The article I am about to present was presented by Arthur & Fiona Cristian, Love For Life, April 2011. This article struck me, but it also brought to mind how much I have changed over the years and how I have come to this juncture in my life so that I can relate to what they are saying in their article. Had I read this article 20, 30 or even 40 years ago, I would probably had thought that they were crazy, but now, after researching and learning so much about how our world has been constructed around us, I can say that today, I can hear this, read this and see how this makes so much sense. 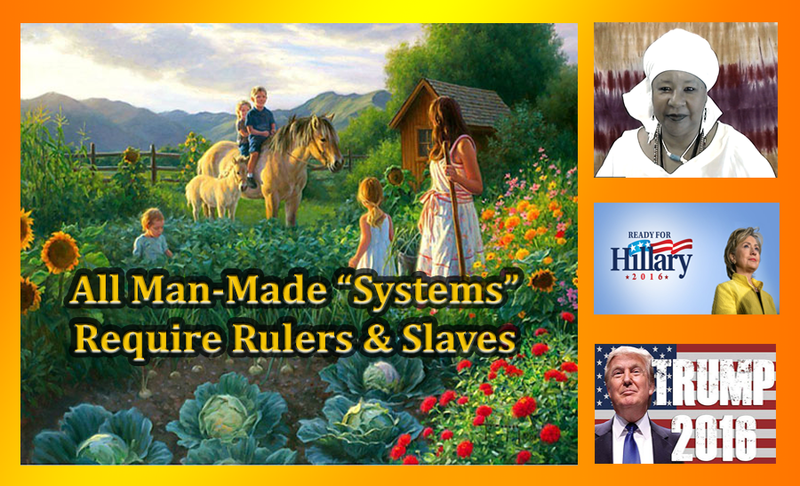 All man-made systems require slaves and rulers. It is impossible to avoid this fact, this circumstance. Being forced to live under the rules, regulations, rituals, procedures, conditions and contracts of any man-made system causes a loss of uniqueness to everyone exposed to them. No man, woman or child is answerable to anyone or anything re-presenting a man-made system. We were never meant to give up FULL-responsibility for our lives, which is what we do when we acquiesce to any man-made system, be it cashless or not, gold standard or not, religious, political, legal, social, environmental, spiritual, philosophical, commercial, esoteric, international or domestic or not, and fall under the standing of its authorities, representatives and enforcers. All man-made systems are a scam as will be the coming New World Order system with its cosmic, galactic, Christianized, feel good/feel god, “Oneness” glue remedy to cure the present earth-wide chaos engineered by the tiny few who still want all the power and glory. This cashless “one-world” remedy will be overseen by an earth-wide power structure no different to the Federation overseeing the non-sense cashless world of Star Trek. Tools used by those behind man-made systems to indoctrinate the masses include all religions, holy books, history books, science, the New Age and all forms of education stemming from any of the many universities presently offering “system career” courses across Earth. Placed on the conveyor belt running through factory planet earth, brainwashed men and woman are being manufactured in sameness molds to produce individuals (in-divide-u-all-s). We are already unique, not one the same as the next, but all man-made systems trick us through propaganda and manipulation into giving up our uniqueness so we can become the willing slaves and rulers in “The System”. All man-made systems (all beliefs, faiths and associated opinions) cause loss of uniqueness. As already mentioned we were never meant to be in the image/likeness of another mans thought. Broken up into individuals, we no longer feel the bonds between us which is why we think we need an artificial system to co-exist. All Freemasonic/Satanic holy books, and belief systems exist to keep us in an individualized state so that we accept “The Systems” that control us therefore giving our power and life-force-energy away to those hiding behind “The Systems” to rule us with. There is no other reason or purpose for their existence. They are all designed to con us into being ruled by man-made systems, to con us into accepting third party figures, whether saviors or “leaders” so that we give up the responsibility for our lives here and now to them. Even to the point where we no longer think that what is happening on Earth is important because we believe in “life after death” or the ascended masters of the Galactic Federation or some “other world” out there where we will have peace from the pressures of life under “The System”. They all come packaged as fairytales with fairytale props and characters for us to give up our responsibility for our lives to here and now so that we can be ruled by those Freemasons/Satanists hiding behind “The System” of those fairytales. This is why the Freemasonic/Satanic world always operates in the shadows. They are the master puppeteers pulling at the strings of the belief, faith and associated opinion of their marionettes. Just as little Mary is unable to bring forward the Alice in Wonderland characters and settings she is playing to prove they exist neither are those who believe in “The System” fairytales able to bring forward 1st party to 1st party proof/substance of their existence. All they can do is re-present them but they are the only ones present; the characters are not. No matter how intense and for how long they believe in their fairytales and how much they argue for them and protect them, the believers only have their belief, faith and associated opinion. The brainwashing is extensive. Individualism is as if we go to the ants and say, “Hey ants! We are changing your values and giving you a new program called individualism. You are now free to be in-divide-u-all-s; you can each have your own truths and no one has the right to take them away from you.” And so the ants go off to become materialists, Buddhists, Christians, Jews, atheists, republicans, democrats, New Agers, conservatives, punk rockers, journalists, psychologists, politicians, priests, banksters, judges, lawyers, etc, etc. Meanwhile back in the ant world colony, who is taking care of the babies and the elderly and maintaining the nest? Inevitably, the ant-world perishes and all individualized ants go with it! This is what is happening to MAN and MANS Earth. Is this the consequence we all want? We each need to take full-responsibility for our lives so that together the responsibility for taking care of Life is taken care of. Passing the buck to a 3rd party God, man, woman, fiction, law, political party, piece of paper, electronic/digital recording device, etc, stops each of us from taking full-responsibility for life. We are determined to co-create Kingdoms/Do No Harm Communities to be the living-remedy that provides an everlasting peace, freedom, truth, joy, abundance and do no harm for all of life without the need for having slaves and rulers or causing loss of uniqueness. Note: To continue exploring the information we share and fill in all the other missing pieces please read the articles: “Re-Presenting Is The Pull Of Duality Into False Consciousness” 19th April 2011: http://loveforlife.com.au/node/8129, “Introduction To “The Curses Are Being Returned” 11th June 2011: http://loveforlife.com.au/node/8183 and explore the many videos, podcasts, articles and recent Facebook/email discussions/debates posted here:http://loveforlife.com.au/node/6608 and here: http://loveforlife.com.au/node/3385 and here: http://loveforlife.com.au.